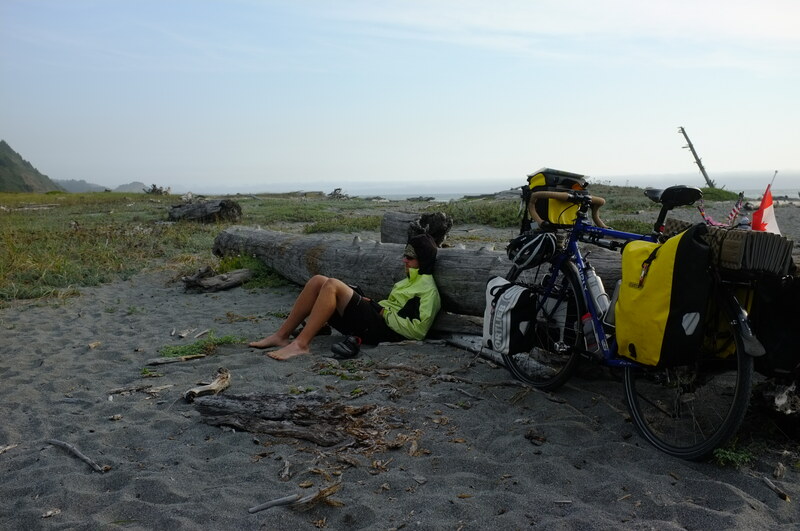 On a beach in Northern California just outside of Redwood National Park I lie in soft, salt and pepper speckled sand. The sky is streaked with the red glow of the setting sun. My nostrils tingle from the salty sea air and its fishy perfume that makes me feel far from home. My ears tune to the gentle ambiance of the crashing surf. 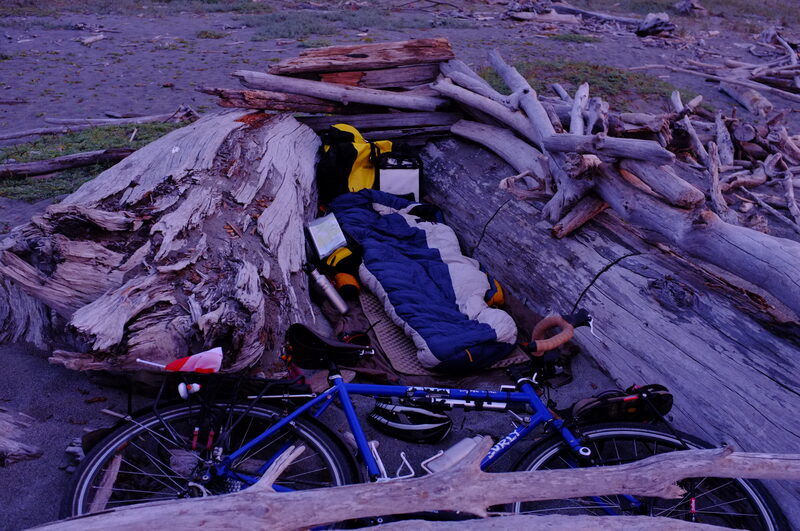 A cold wind blows but cannot penetrate my driftwood fortified campsite. This morning, at Del Norte Coast Redwoods State Park, urgent protests from my bladder force me out of my tent and provide time for reading while still abiding my twenty by twelve rule. Riding twenty miles by noon means I will have a good day. I require twenty to thirty miles just to be warmed up. Failing this rule means that my muscles are trying to loosen during the hottest part of the day when I don’t feel like riding to begin with. My camera cannot possibly capture the enormity of these trees nor can my words capture their majesty or the impact standing before these giant sentries of a forgotten age has on my psyche. I am in awe. They are a sight like no other, instantly transporting me into the present moment yet remembering the giant creatures who once roamed this planet: the dinosaurs. The earlier than normal start to the day also provided extra time to aid a fellow tourer who rolled into camp last night with a broken spoke. 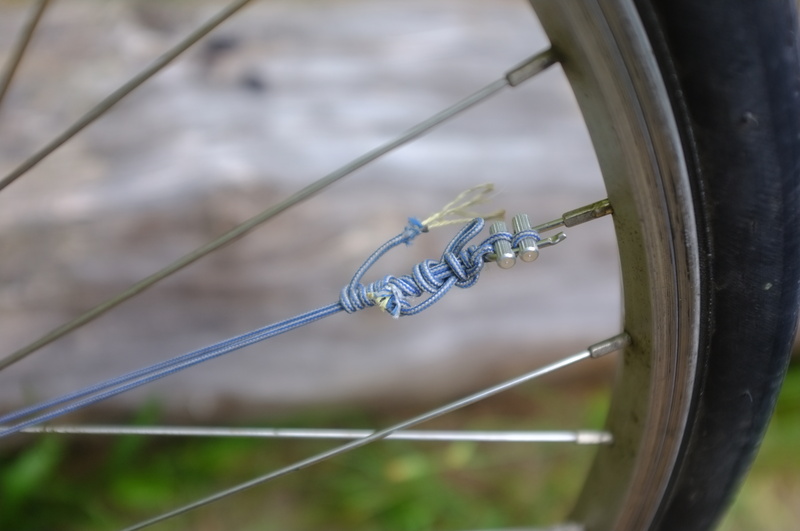 I am carrying two kevlar spokes and was pleased to have the opportunity to test one out. I was especially happy to be testing it on someone else’s wheel! Besides, helping a fellow traveler always brings great joy and is one of the few ways I can “give back” while on tour. The climb out of the campground was not nearly as bad as I anticipated – hills always seem worse on the way down – and the two-and-a-half mile climb passed easily. Krysta elected to have her panniers sherpa’d to the top by a departing vehicle. Cheater. I planned to spend another day here but after laying around the campsite reading all afternoon yesterday, I was ready to push on. Proceeding down the hill and through the fog was a blast and we were soon at The Trees of Mystery. This place is known for its gondola rides through the redwood canopies. 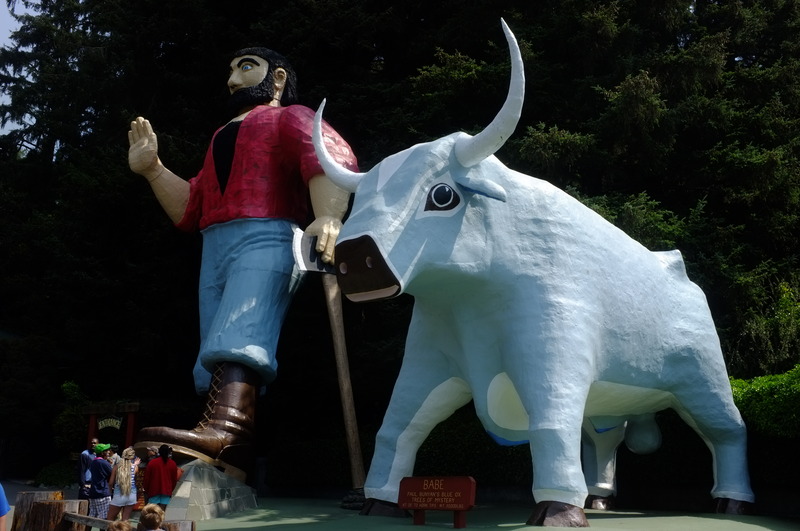 The giant talking Paul Bunyan was also featured on an episode of the podcast This American Life. My budget being super tight, I passed on the gondola ride but was all to happy to explore the free Native American museum. The clothing of the various tribes was my favorite part of the exibit. Also of great interest were the old photographs – including two large photo books, one of the men and one of the woman – and the old weapons. 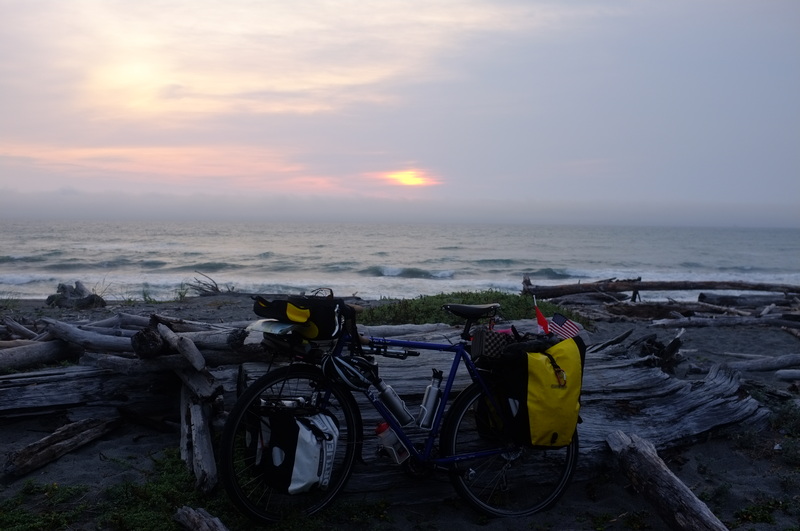 In the town of Klamath, we stopped for food and coffee and said, “hasta luego” to each other (goodbyes are not worth saying as its all to common to keep bumping into other tourers). I was feeling energized from my partial day off. Kysta however, was not. She decided to ride back into town yesterday, tackling the large ascents yet again, and did not return until after dark. She planned to spend time resting in this little town. I continued on. It feels good to be alone again. I stopped in the tiny town of Orick, CA for food. I did not make it much further. 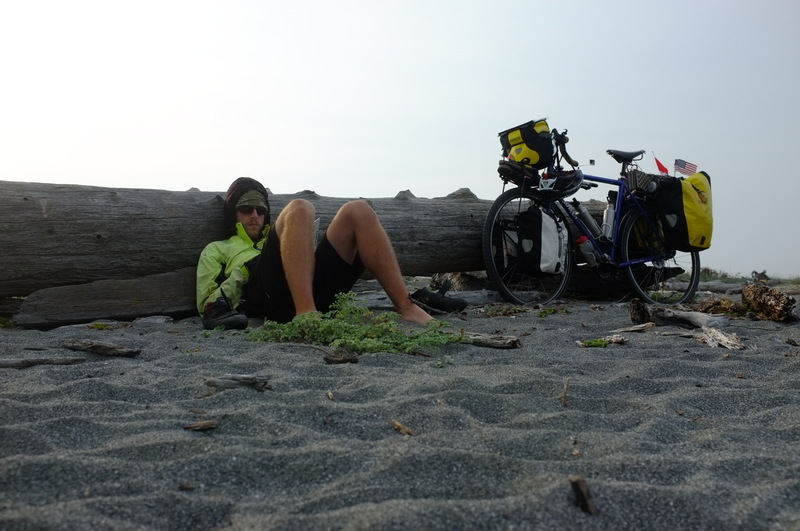 The frustration of headwinds and the allure of a beach all to myself caused my legs to stop their endless rotation. I was here to stay. 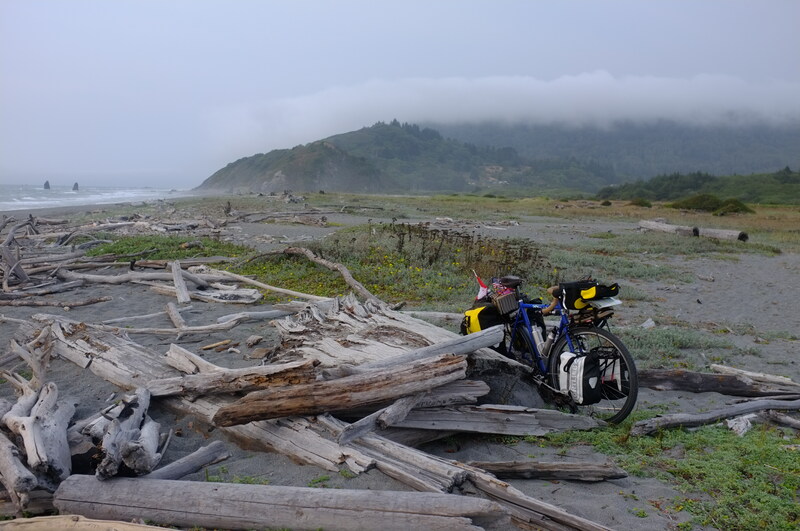 I found a backrest of driftwood and immersed myself in the adventures of Lewis and Clark. I was soon fast asleep. Alternating between periods of reading and napping, the evening passed quickly. It would soon be dark. It was time for me to get to work. The beach is very windy. To sleep without a tent would require a wind break. Two large driftwood logs running almost parallel became the base of my fortress. A nearby stack of smaller driftwood became the walls. As for the roof, it required no work; only careful observation of the setting sun, stars passing between clouds, and the full moon rising over a distant mountain range and vialed in a thin layer of clouds. I could not ask for a better bedroom. Although, I could have done without the rude awakening. Around 1am, a crazy clown voice skipping around my fort and singing some ridiculous song about camping in sand dunes released a torrent of cold sweat from my pores and forced my body upright. A quick inspection of my surroundings found no such demon. I was having a nightmare. No matter how beautiful the location or how many times I’ve done it, solo stealth camping is a frightening proposition. An intimidating endeavor well worth the occasional cold sweat for the opportunity to sleep in incredible places and experience a world few even see. A kevlar spoke replaces a broken one on a fellow tourers rear wheel. Paul Bunyan and his blue oxe, Babe, tower over tourists. Paul speaks to you and answers your questions. 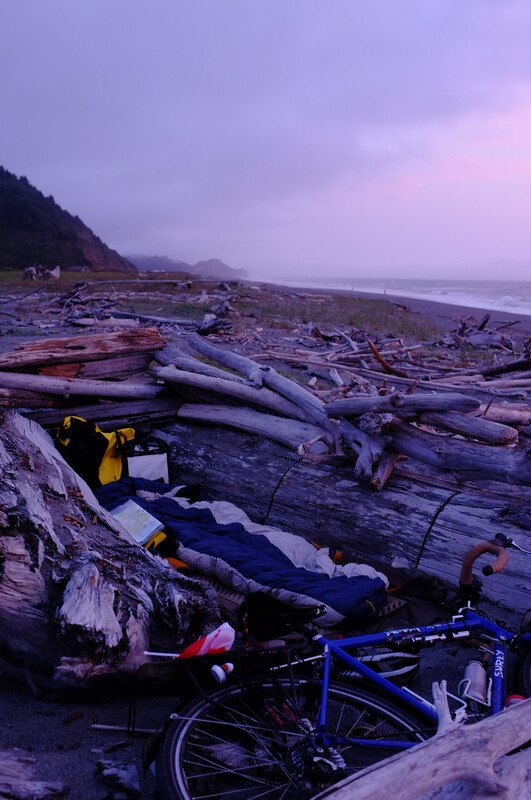 The driftwood that eventually becomes my fortress and the mountains in the background. Time for some R &R.
What an incredible place to sleep. Can you hear the waves and smell the sea? Nice to meet you as well. That’s awesome man. Glad to hear it. It also makes me feel more confident carrying into the middle of no where! I just arrived in San Fran. Treating myself to dinner. Any chance I can stay tomorrow night? Thanks for aiding us when (the other) Ryan came into camp with a broken spoke (by the way, he broke another spokes few day later and used the Kevlar string again to get to San Francisco). 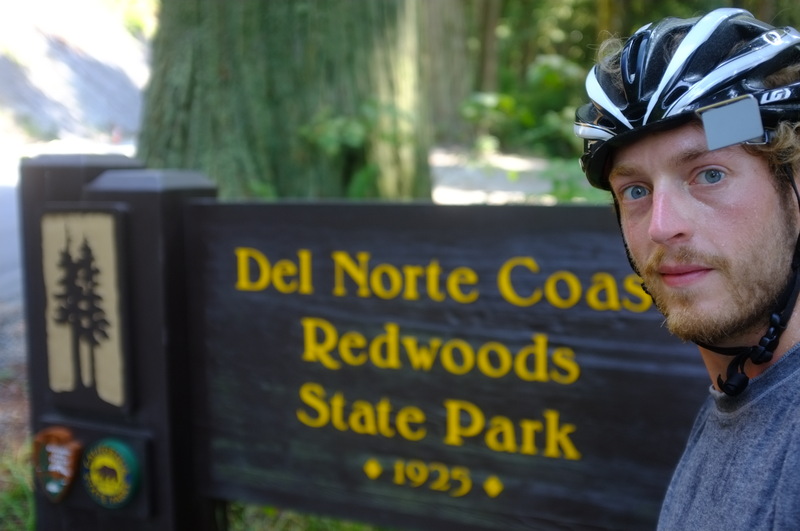 We made it to the Bay Area two days ago (Fri – 15 Aug) after a beautiful ride through Marin County. Have a good stay in S.F. and rest of your ride southward.